Is Alex Chinneck een kunstenaar of een goochelaar? Met zijn nieuwste werk in Londen weet hij iedereen voor de gek te houden. Het lijkt net of het bovenste deel van het marktgebouw bij Covent Garden is losgerukt en aan het zweven is. In werkelijkheid is het een kunstwerk van Alex Chinneck met de naam Take my lightning but don’t steal my thunder. De stunt die Chinneck uithaalt is zo goed dat het eigenlijk zonde is om te verklappen wat hij heeft gedaan met het 184 jaar oude gebouw. Wat je hier ziet is een replica van het marktgebouw die in de studio van Alex Chinneck is gebouwd. Door een speciale constructie aan de binnenkant van het gebouw lijkt het bovenste deel te zweven. De grote grap is dat het echte gebouw nog helemaal intact is, maar aan de andere kant van de hallen te vinden is op een identiek gebouw. Ondanks dat dit kunstwerk op het verkeerde plein staat trappen mensen massaal in deze geniale grap. in an interview with chinneck on the project’s cultural and historical references and themes of architectural manipulation throughout the breadth of his work, the artist told designboom, ‘art has the capacity and license to re-imagine, re-present and reinvigorate the world around us and so architecture is a brilliant canvas for creative exploration and distortion because it surrounds and contains us. I like how creative practice can make the everyday world feel momentarily extraordinary and by theatrically manipulating familiar architectural scenarios this is what I try and hope to do.’ read the full interview to learn more about the construction, development and conception of the installation on designboom. Covent Garden has long been home to a diverse collection of living statues and fairground freaks, a levitating shaman competing with unicycling jugglers and motionless men in their silver-painted suits. But now, in a moment of jaw-dropping trickery, the architecture is joining in the fun: the Victorian market portico appears to have been ripped away from its colonnade, and left hanging in thin air. This surreal stunt is the work of 30-year-old artist Alex Chinneck, master of architectural illusion, who has previously turned buildings upside down, pulled off their facades, and let them slither down in a heap on the pavement. 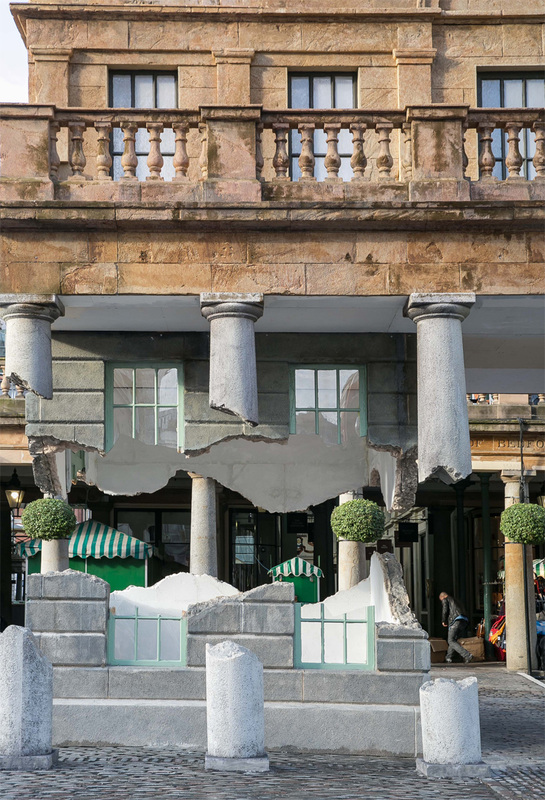 A Uri Geller of bricks and mortar, this is one of his most ambitious works yet, fabricating an imaginary eastern entrance to the market hall that he’s then torn in half and jacked aloft, its Portland stone columns and granite walls left brutally severed. “I wanted to play on the theatricality of this area, and make something physically extraordinary,” he says. In place for the next three weeks, it is already attracting crowds of gawping passers-by, as a visually arresting one-liner, seemingly made for the Instagram era. The illusion of weightlessness is made possible by a lot of polystyrene and 16 tonnes of steel. A 12-metre armature hidden inside the structure is connected to the ground through an innocuous market cart, in which a 6-tonne counterweight stops it all from toppling over. The effect of weathered stonework has been immaculately recreated by Richard Nutbourne and his team of scenic artists – who usually work on stage sets for the opera and ballet next door. Covering the CNC-milled polystyrene blocks with plaster and granite sand, they have mimicked the neighbouring gnarled stone even down to the detail of moss, electrostatically flocked onto the surface. “My work is usually very simple in its concept,” says Chinneck, “but it’s a nightmare in execution.” Eight months in the making, the Covent Garden installation is the product of a 100-strong team of architects and engineers, carpenters and set-builders, and more than 500 hours of digital carving. It follows previous commissions in the piazza from Jeff Koons and Damien Hirst, Banksy and Sam Taylor-Johnson. Gnomically titled “Take my Lightning but Don’t Steal my Thunder”, the piece is Chinneck’s fourth installation on show in London at the moment. It joins two facades on Blackfriars Road that have been entirely flipped upside down and a derelict warehouse in Hackney, which looks like any other abandoned building with broken windows, until you realise every pane of glass has been identically shattered. Last week he unveiled a house in Southwark made of 10 tonnes of wax bricks, which will be heated each morning over the coming month, until is is no more than a mushy puddle on the pavement.